In his stable, he had two similarly built horses (we will call them Sun and Moon). Sun had won Group I races, while Moon, though a handsome black, was a laggard in Class V (lowest rated horses). 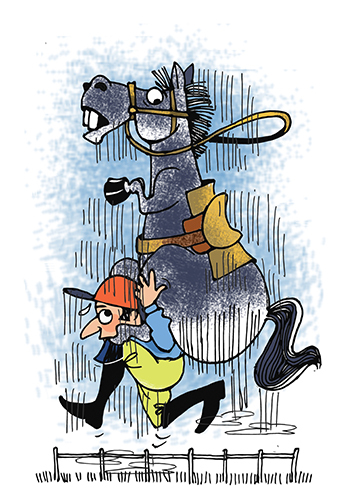 Western India racing shifts to Poona in the monsoon. Moon was entered to run in a Class V race on a bright and lazy September afternoon. Neither pundits nor punters fancied Moon (previously, he had run five times and was nowhere on board, leave aside winning). Moon was quoted, in the bookmaker’s odds, at 15-1. An apprentice jockey was selected to ride Moon. The race began. Moon, from pillar to post, won like a champion, shocking experts and railbirds alike. After his spellbinding victory, Moon was led triumphantly into the paddock. Suddenly, there was a downpour. Before unbelieving eyes, Moon began to drip black paint. The stunned audience soon realized that the horse was not Moon; it was Sun. Naturally, being a Group I winner, he easily decimated the mediocre Class V field. These were the 1930s. Before the racing officials and the stewards recovered from shock, the trainer zoomed into the paddock, with two of his trusted jamadars (syces), and spirited away Sun out of the racecourse and onto a waiting truck. They sped away to his farm, about an hour away from the Poona racecourse. In cold blood, the horse was killed and its carcass burnt, to destroy evidence. Or so, he thought. The stewards of the Royal Western India Turf Club were not amused. No one had ever pulled off such a daring caper. If the same thing were to happen today, (though unlikely, in the days of the DNA chip) the trainer would most certainly have been jailed. Cheating the punters, bookmakers, administrators, followed by the cruel and ruthless destruction of a fine animal, the so-called evidence. He did not even put up much of a defence during the stewards’ enquiry. He was lucky to escape with only a lifelong ban on training thoroughbreds. Barely 30 something when banished, he never appealed for mercy. He never trained again, although he lived to a ripe old age. Sun, the unfortunate horse, had had his revenge. From the time he was a toddler, he knew only horses. Hardly literate, no other career was feasible. The inglorious end of his moderately successful training career led him, therefore, to become a horse breeder. Two decent stallions did duty at his stud farm, and he managed to breed some fairly good horses over a period of time. He fancied himself as a stallion too and his misadventures became the stuff of legend. In a particular village outside Poona, lots of boys and girls made claims on his paternity. Had his girlfriends been Parsis, he would have single-handedly made the most handsome contribution to the local Parsi population. His libido continued in his late 70s and he proudly proclaimed that its secret was that he had swallowed a live queen ant by breaking her nest (a most hazardous venture) which assured him of lifelong virility and fertility. Even if he had not gained infamy by passing off Sun for Moon, he would have still made a name for himself for this extraordinary ability to strike alliances, without discriminating on grounds of caste, color, age, community — and some said, even gender. Over the decades, he acquired a sound knowledge of thoroughbred pedigree too, and believed that blood will always assert itself. Good pedigree will throw a good horse. His own pedigree was quite remarkable. In the 1890s, his father had migrated from Iran to Poona (as it was then called) to become a leading horse trainer. He was ramrod straight. Our anti-hero’s son reached even greater heights. He became the most successful trainer ever in the annals of Indian racing, winning countless Indian and regional classics including a record number of Derbys. More importantly, the son’s integrity was impeccable. Like Caesar’s wife, he was beyond suspicion. In turn, he too had a trainer son, who achieved no mean success including winning Indian Derbys. His son and grandson politely chose not to talk about that afternoon when Sun and Moon were, well, confused. Sometimes, excellent pedigree can also throw up a bad horse.